Liberty University chancellor Jerry Falwell Jr. spiked a column in the student newspaper that was critical of Donald Trump. That’s pretty shocking. If Falwell had spiked a column because it advocated something against the university’s understanding of Christian doctrine (e.g., a column defending abortion rights), it may or may not have been defensible, but it would have been at least understandable. If Falwell had spiked a column critical of him personally, it may or may not have been defensible, depending on the nature of the criticism, but again, it would at least have been understandable. Understand: the chancellor of Liberty University refuses to let this completely normal statement, especially coming from a Christian student, be published in the campus newspaper, because it criticizes his preferred political candidate. Unbelievable. Vincentian Father Dennis Holtschneider indicated to the university community on Friday in a letter that the “Unborn Lives Matter” message constituted “bigotry” occurring “under the cover of free speech,” The Daily Wire reports. The College Republicans followed protocol in submitting the design for approval to promote the group, its pro-life views, and its meeting times before hanging the posters on campus. However, the request made its way to Father Holtschneider, who responded that the administration would protect the university community from the pro-life message’s bigotry, the report said, and that the pro-life poster “provokes” members of the controversial Black Lives Matter political movement, the message of which is allowed on campus. So now it’s anti-Catholic to say “Unborn Lives Matter” on the campus of America’s largest Catholic university. Because … black lives are more important than the lives of the unborn? Really, Father Holtschneider? More to the point, one is not allowed to make this statement on campus, because it’s “bigotry”? Since when does Black Lives Matter get a veto on what can and cannot be said on campus? Message to students: don’t even try to express empathy! Message to students: don’t deny your guilt! Message to students: don’t recognize social progress; things are still horrible! Message to students: don’t defend the guilty! Here’s a link to the entire list. This kind of thing trains students to be timid, silent, fearful, and conformist. Parents should be wary about sending their kids to colleges that will cripple their minds like this, and put their kids at risk of stepping on a p.c. land mine for violating orthodoxy, and blowing up their college career. FIRE Rating: Whether the school’s speech codes foster or infringe upon free speech. As rated by the Foundation for Individual Rights in Education. Relevant Events Since 2014: Events on campus that indicate a commitment by faculty, administration, and/or students to protect or restrict free inquiry and viewpoint diversity. We ignore events that involve just a few students or professors and focus on those indicating broader sentiment, norms, or policy. Posted in Christianity, Culture war, Education, Politics, Political Correctness, Neo-McCarthyism. Tagged abortion, Liberty University, Heterodox Academy, Black Lives Matter, James Madison University, DePaul University. “James Madison” University is doing exactly what its namesake warned against: the danger of a majoritarian faction. This is what the new civil religion certainly is, and it is trying to prevent any other faction from expressing itself in public. Insofar as free speech should be characteristic of a university, both James Madison and Liberty deserve scare quotes around “University”! I’m actually glad they are posting a list. It’s a necessary part of political correctness that it’s proponents never see themselves as promoting a set cultural orthodoxy even while they are busily policing its precise boundaries. But as they start publishing censorship lists the divide between their rhetoric and their actions will become rather obvious to any observer. This will create a crisis. Either the progressives can maintain the rhetoric about ‘diversity’ and ‘tolerance’ and immediately revealed as hypocrites or they can abandon it and become the new oppressors. (I think these are the only two options because while the capacity for ‘Doublethink’ is certainly expansive it is not infinite.) The first path would require less bloodshed to overthrow their hierarchy but the second path is already occurring. If there is any consolation it is that the second path leads to inevitable defeat for the progressive project, as tyranny and oppression cannot help but breed their own downfall. At minimum, the lists will serve as ‘best ways to rebel and tick off your square parents’ list for the next generation of teenagers and college kids. So now it’s anti-Catholic to say “Unborn Lives Matter” on the campus of America’s largest Catholic university. I’m pretty sure St. Vincent de Paul just turned over in his grave. Re: James Madison. I didn’t see in the linked article where it is mandated that students cannot use these terms and phrases on campus. It may want to discourage them, but as a public university I doubt it has the authority to ban them or provide any punishment for using them. I was censored by Falwell Sr. back in 2008 for writing a letter critical of Bush and the Iraq War in the Liberty Champion. I would like to be clear that I love Liberty and I especially love my professors there. I am very thankful for my education there. It is a shame that the administration embarrasses itself in these ways and it reflects poorly on an institution filled with wonderful people. I follow Heterodox Academy pretty closely, and nixed a couple of colleges my daughter was applying to for admission next year. As far as the Falwell incident goes, I don’t like it as a matter of free speech, but being the Publisher has its privileges. Just ask Pinch Sulzberger. As an aside, I have heard few men in my life speak about women the way Trump did/does. Every one that did was a collegiate athlete. That kid must lead a very rarefied existence. We’re reaching the point where it will simply be easier to issue students a list of approved phrases which will be the only things they are allowed to say. But our host just yesterday wrote that the growing number of unmanly “chestless men” was a terrible plague on modern America. If that’s the case, then telling white men to stop complaining about any little inconvenience or difficulty they face is a natural – indeed mandatory – part of the solution. A confident, manly guy doesn’t whine about discrimination or demand special treatment because he’s a delicate special snowflake, he bucks up, stiffens his upper lip, and gets down to work anyway. Right? Or is it only non-white men who need to man up and show their grandfathers’ grit and fortitude? Black dudes, get a grip, things are so much better now, be patient. White dudes, tell us more about your poor wounded feelings and battered self-esteem! Since they figured out that throwing hissy fits about language gives them power. This kind of thing trains students to be timid, silent, fearful, and conformist. Well it is really great training for the corporate office world! Things you cannot say (with a straight face)on the James Madison University campus: “Seriously…JMU was my first choice, I didn’t even apply to William and Mary or UVA. Perhaps silly and overweening, but not at all the mandatory campus-wide thought policing and reeducation described. “Things we would prefer our freshman orientation volunteers not say at orientation” would be a truthful description. Punished and Purged for Probity about Purity Preferences by a Perfidious Post-Puritan Pastor! Gagged while Gregariously, Gushing Gratiutios Googles by Grim Gay Gestapo. I still think the video of HRC telling BLMs that you have earn respect was still the pushback on their movement I heard from anybody. BLM also might help the rest of us by issuing a list of actions and phrases which do not provoke its supporters to rioting or assassination. Just trying to stay in compliance guys (if I can say that)! “[not black] lives matter” is usually deployed mocking and belittling “black lives matter”. It would have been wise for the students to avoid needlessly antagonizing others for a reason unrelated to the lives of the unborn. They and their cause are probably lucky the administration stepped in as the voice of reason. 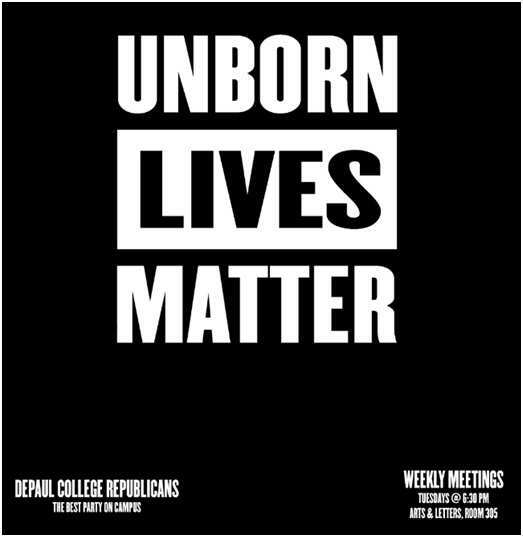 Would it be ok to say “Unborn Black Lives Matter” at DePaul? Seeing as how abortion disproportionately affects minority communities, would this satisfy our cultural overlords and their clients in BLM? Margaret Sanger, the racist eugenicist, would love for us to forget the way that Planned Parenthood kills black lives every day. If BLM truly cared about black lives, then they’d be against Planned Parenthood. Or is it not really about black lives? I used to spend many hours studying in the FSM Cafe, and it still remains one of my fondest memories. As a freshman at Berkeley, I got to celebrate 40 years of the Free Speech Movement by going to see Howard Dean speak from the roof of a patrol car à la Mario Savio. And though I was a liberal Democrat, I also admired the courage of the Berkeley College Republicans to stand up and challenge the prevailing culture on campus. All in all, Berkeley’s traditions taught me the value of free speech, especially on college campus. So needless to say, I am ashamed to see UC Berkeley falling near the bottom of Heterodox Academy’s rankings. One of the reasons is that, just last month, a group of people decided that the College Republicans could not promote their presidential nominee on campus because it represented hate speech. The College Republicans’ cut-out of Trump was torn up, and their members violently attacked. All the while, the campus police stood by and did nothing. What a shame. Berkeley may continue to proclaim the Free Speech Movement, but it certainly has ceased to carry its mantle. To be fair, DePaul’s president disallowed the Unborn Lives Matter sign because it was a replica of the Black Lives Matter logo. The decision was regarding the design, not the words, of the poster. To really understand college and university presidents, think of them as business elites wholly uninterested in education. In this instance, DePaul’s president is a trademark attorney protecting his client’s intellectual property. Simple as that. So now it’s anti-Catholic to say “Unborn Lives Matter” on the campus of America’s largest Catholic university. Because … black lives are more important than the lives of the unborn? Really, Father Holtschneider? More to the point, one is not allowed to make this statement on campus, because it’s “bigotry”? Say it loud, I’m bigoted and proud. I’m getting very close to the point where, if I’m going to be called “bigoted” whether or not I say X, I might as well go ahead and say X. The James Madison list is incredible. Apparently almost any innocuous cliche is now too offensive to be uttered. Best not to say anything than risk being seen as noninclusive or bigoted. Next list–forbidden body language and gestures. In the United States, approximately 200 African-Americans have been killed during police encounters this year (this statistic, as far as I can see, includes all such deaths including armed suspects firing at law enforcement at the time they were killed). Today, and every day in the United States, somewhere between 900 and 1200 unborn black fetuses will be killed by abortion. Perhaps the pro-life group should retool the poster to read “Unborn Black Lives Matter,” and include the statistics I’ve cited here. As to the larger topic: my children’s strategy for college is: get a degree as cheaply as possible because it is nothing more than a job credential; for actual things you want to delve into deeply and learn well without being harassed for being white and Catholic and non-PC, there are books, free online classes, and one-on-one instruction. It seems to be working for them. Liberty is a weird case. It is a clearly subpar university, and I am very concerned a lot of conservative Christians are duped into sending their kids there out of fear of the very real problems in secular universities. Outside of some position in ministry in a conservative Evangelical church or parachurch organization, I simply do not see how it could serve a student well. But one thing they do very well is subsidize the education of their students. I knew a few people from my hometown who went there, and they received very generous grant packages for their studies. Considering how financially strapped their families were, this was huge. Without a school like that, they almost certainly would have fallen through the cracks: not stellar enough (or minority enough) to get into a school with a massive endowment, not poor enough to qualify for FAFSA, no viable way to fund themselves with outside scholarships. In some way, I think it is better to understand the school as a sort of Christian welfare system for ministerial education. At which point expecting them to meet the burdens of free inquiry you should insist on from a liberal arts college or research university is a bit of a category error. Falwell still made a big mistake though: he conflated politics with religion. That is just as poisonous as a liberal arts college dropping intellectual liberty. Also, we should note the University of Chicago’s continued leadership in free expression. That is a truly fantastic institution. I’m also pleasantly surprised at the performance of my alma mater. Glad to see Heterodox publish this list. I would hope that every college would be preparing their students to be good citizens to respect self governance. Students should be encouraged to participate in the public sphere and speak out when another’s free speech rights are denied, no matter how much they may personally oppose the message that is expressed. I should note that Liberty and DePaul are private, religious universities so they are not violating their students’ FA rights by censoring speech conducted on site. However I agree with Rod. private schools which bar unapproved speech are not preparing their students to live in a democratic society. Censorship should be discouraged at all campuses. We never learn from jumping to conclusions do we? Instead of believing outright the attention-seeking students, just maybe Falwell had other reasons for discarding the article. Regardless, has anyone asked Falwell why he spiked it? One of the reasons that “inclusion” has become so important on the campuses of private American colleges and universities is that these institutions are first and foremost private clubs. As with any institution, the #1 mission is self-reproduction. Yet colleges and universities have a special challenge in that the members of their clubs turn over every four years. Private colleges and universities have the double challenge of depending on the old members rather than tax-payers for the financial sustenance which makes the club possible in the first place. And they have the triple challenge of living under the regime of Diversity. As the old social bonds of ethnicity, race, region, religion, and class are destroyed through Diversity, new social connections must be created ex nihilo. If tomorrow’s alums (aka today’s students) don’t feel those old school ties, they won’t donate a portion of their earnings to their alma mater. For a private club, that is the path to perdition. Campus administrators therefore must build social ties on campus and do so from the ground up. No wonder we’ve seen an explosion in the number of of professional administrators on campus (vice presidents for campus life, assistant deans, diversity czars, psychological counselors, etc.) whose job is to mold these future alums into a group committed to the college or university “community” above all things. Thus the importance of student enablers such as James Madison University’s First Year Orientation Guides (FROGs) who are the audience for the “things you cannot say” list. “Inclusion” is not just a magical SJW mantra (although it is that). It is more importantly an economic strategy to reproduce the institution in the long run, one demanded by the regime of Diversity. I’m prolife and understand both the sentiment behind that poster and — hopefully — the naivete that went into the wording. But seriously, if I had been the mother, teacher or friend of whoever came up with it, I’d have cautioned the group to consider how those words might be taken. After all, you want people to think about what’s happening in an abortion, not that prolifers are hostile to minority groups and/or the Black Lives Matter cause! And that IS what it sounds like…as if prolifers are mocking that cause, and very possibly African Americans in general. I can understand why the head of a Catholic school might not want what is associated in the public mind with Catholicism, the prolife cause, mocking Black Lives Matter. If he banned free speech in making his disapproval known, he went too far. But I can see why it happened. Lord knows it’s not the first time prolifers have made themselves look bad on a picket line, but this time I suppose the president figured they were doing the same to his school. Sigh. I read list from James Madison U. Point #11 is the “You speak the language very well” admonition. What in the world do they mean? That there is no better or worse grammar or diction or syntax???? So incredibly relieved that when I came to the United States not knowing a word of English, the inclusive claque didn’t yet exist. Colleges and universities often go too far in trying to accomodate all current and potential critics, i.e.,parents, students, donors, alumnae, professors, AND the public at large; it seems to go with the territory. But when it comes to the issues of social co-mingling, non-discrimination against minorities, student relations in general, I think this sort of hostile criticism overlooks the fact that they are, in effect, trying to instill a new form of good manners for the purpose of helping students from very different socio-economic and, often as not, cultural backgrounds get along. Demanding totally rational explanations for socially accomodating behavior makes about as much social sense as the feminist criticism of old-fashioned chivalry on the grounds that holding doors open for women or letting them walk in front demeans and/or actually subverts their ability to do things for themselves, etc. In a nutshell, these new Student Life guidelines and the like are just there to help a bunch of kids, many of whom haven’t even been taught old-fashioned manners, to somehow get along. Because manners always involve taking into account feelings and possible vulnerabilities, no one is ever going to be able to justify every point in strictly rational terms. Hey, sjw, stop saying things are horrible. That’s Rod’s job! I think that’s the core issue of the issue: the divided worldview between those who recognize sin and think recognizing it is helpful, and those who cannot bear anything that would limit them. There is the City of God and the City of Man. The City of Man cannot admit to itself that there is anything more than their powers, desires, or feelings. Each moment is the penultimate: a moment of crusading to wreak vengeance, indulge in personal epiphanies, and maximize pleasure, power, and triumph. All sort of like a 4 minute indie-pop song with an escalating crescendo at the end of a Grey’s Anatomy episode: urgency, meaning, vindication, emotional indulgence are here now, now now. Those who look to the City of God know we must restrain momentary feelings. There is a past, a future, and an eternity, and it is rash to act upon impulses. The facts of this world speak to the truth of natural law and the City of God. We can learn to endure suffering, to forgive sinners, and to identify our own sinners. From there we can find grace. But it requires us to pay attention, to leave our own passions behind long enough to recognize the world is bigger than our own grievances. But we’ve developed a society based upon attacking attention, memory, and suffering. We descended from the language of grace to a therapeutic reality, and since that doesn’t work we’re in the stage of instant gratification: righteous burn-it-all down SJW-mob anger, zoned-out on the screen pleasure, or drugs to mimic the grace we so long ago walked away from. What can I add to that? I guess only a little plea for understanding for those of us on the left who want to be generous towards religious conservatives but find it very difficult at times because of stuff like this. This is one of the reasons I’m a reader here – Rod is a bit unusual on the Christian Right for his willingness to openly discuss their mistakes and deficiencies. It helps me not to fall into the trap of just writing off the entire Christian Right as people who will never deal with us in good faith. Lately, with Trump, I’ve needed all the help I can get on that front. Would it be ok to say “Unborn Black Lives Matter” at DePaul? After all, you want people to think about what’s happening in an abortion, not that prolifers are hostile to minority groups and/or the Black Lives Matter cause! And that IS what it sounds like…as if prolifers are mocking that cause, and very possibly African Americans in general. I agree that progressives and liberal social activists should embrace a positive agenda of “social orthodoxy” and not hide behind claims of neutrality, some do and some don’t. If they were less hypocritical though, would that really address any of yours or Rod’s concerns? Do you think “neutrality” is really the basis of these administrator’s claim to authority? If they didn’t claim to be neutral would that really make a difference? I used to spend many hours studying in the FSM Cafe, and it still remains one of my fondest memories. My impressions of Berkeley and the FSM are tainted by the education of my Berkeley-attending, FSM-invovled Poli Sci professor in college, who rather convincingly made the argument that the Berkeley FSM was, when the rubber met the road, fundamentally about a student’s right to say “F— You!” to his TA; there were many more high-toned arguments but the actual interpersonal conflicts usually came down to Right to Offend. If the modern college free speech movement is about being able to post “Unborn Lives Matter” posters all over campus, truly very little has changed. Rod, I know BLM upsets you, but please be aware that it was not the BLM student group on the campus of DePaul who vetoed the Unborn Lives Matter poster or meeting. It was the president of the university. You, evidently, are very much unaware that many radical Blacks think the enthusiasm for an unlimited abortion license is racist because it results in the destruction of so many Black foeti. You are evidently unaware that a large percentage of fundamentalist Black Christians are opposed to abortion, that there is nothing in their being Black that obliterates the significance of their being Christians and quite fundamentally so. Your article reads “However, the request made its way to Father Holtschneider, who responded that the administration would protect the university community from the pro-life message’s bigotry, the report said, and that the pro-life poster “provokes” members of the controversial Black Lives Matter political movement, the message of which is allowed on campus.” So it was Father Holtschneider who suggested that the poster might provoke the BLM group. I would readily wager that nobody actually asked them what they thought of the poster. If you have evidence that they opposed the poster, please present it.You asked, “Since when does Black Lives Matter get a veto on what can and cannot be said on campus?” Don’t let your preconceptions impair your reading comprehension. Vent your anger on Fr. Holtschneider. Not a ‘minor inconvenience’. But hey, poor and working class whites don’t even get a chance to transgress University speech codes. But we can do both, RS Rogers. Witness to the unjust nature of racially based spoils and go to work. EXCEPT for the good father’s angle of WHAT he sees challening “Catholic and Vincentian values,” this authoritarian act sounds just like what many Catholic “conservatives” have been demanding the administration of Catholic schools do. He just hasn’t picked up on the approved party line that the conservatives want pushed. He has the method down cold. one of the things which has made the US such a prosperous country is our capacity for innovation – which comes from the cultural environment. Between helicopter parenting and now the nuttiness in our Universities – we are destroying the very feature of our culture which promotes innovation – turning kids into timid conforming robots. Ah – it was good while it lasted. jamie, that’s an interesting notion. To be honest, I’m not even sure I learned that much about the FSM while I was at Berkeley (watching the documentary “Berkeley in the 60s” was optional – and well, I opted not to). So I have no argument with your assessment. More than anything, the photo at the top of post ignited a wave of nostalgia for a simpler time when I thought that people acted out on principle for sake of the betterment of mankind. I was disabused of this notion long ago, but it’s still a bitter pill to swallow. Oh, for the days when the civilized response to seeing an “Unborn Lives Matter” poster would have been to flip it the bird and keep on walking – or write “so do women’s lives” on it – than to tear it down or bar it from even being posted. I remember when my college’s administration didn’t even monitor what was posted on its bulletin boards, let alone demand pre-approval. Bring back the 70’s! Don’t worry cecelia… Americans who innovated almost always had to fight against prevailing cultural norms to do so. The timid conforming robots are simply dooming themselves to the dust bin of history. The true innovators will continue to innovate, and in the long run come out on top. meet me at the intersection of bad journalism and bad social social science research.